This circular is sent to principals of all Victorian schools from the Victorian Institute of Teaching. Please ensure that the principal receives this email. 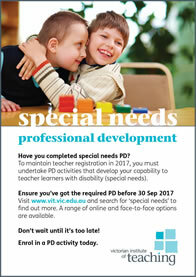 In 2016, 89% of teachers who renewed their registration indicated they had undertaken PD in special needs – this is a fantastic result, however we still have a number of teachers who are yet to complete their PD. VIT recently communicated these requirements to teachers who are renewing for the first time in 2017 as well as those who had not undertaken special needs PD when they renewed in 2016. The Victorian government has made a strong commitment to improving access to and participation in learning for children with special needs. This is consistent with feedback the profession has provided us; teachers told us they didn’t feel equipped to deal with learners who have disability and that they would like more opportunities to understand the needs of these learners to improve learning outcomes. Recent survey findings of those who have completed special needs PD show positive impacts on learning. PD covering special needs is available through a variety of sources (online, face-to-face, free and paid). To find out more, visit the special needs page on our website. Please remind your teachers about completing special needs PD by downloading the below advertisements for insertion into your staff newsletter. If you require a tailor-made article or advertisement please contact VIT’s communication team. Thank you for supporting this important work and taking the time to read this circular. If you have any questions, please email us at vit@vit.vic.edu.au or call the Principal Hotline on 1300 650 375.